DUMBARTON slumped to ninth place in the Ladbrokes Championship when they lost 2-0 to Livingston at the Tony Macaroni Arena. 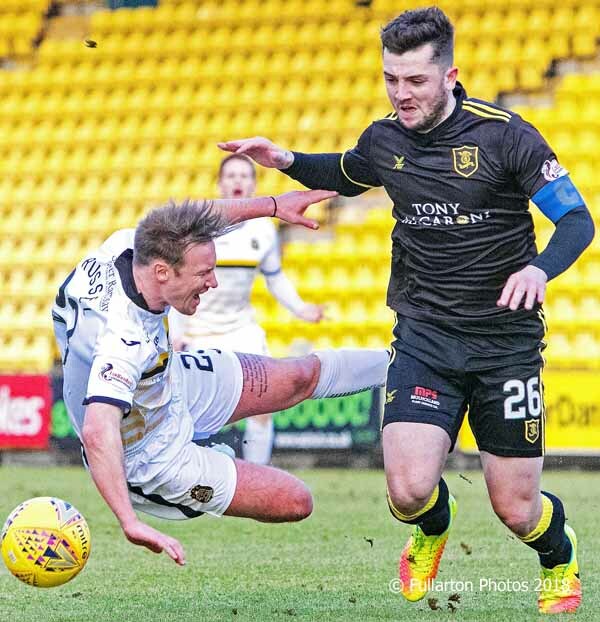 DUMBARTON slumped to ninth place in the Ladbrokes Championship when they lost 2-0 to Livingston in front of a 690 crowd at the Tony Macaroni Arena. Both sides struggled with a ferocious wind in the opening period, but it subsided in the second half. With the match fairly even, Dumbarton — who were facing the wind — gifted Livi an opener on 21 minutes, as ex-Son Alan Lithgow rose unchallenged to nod the home side in front. Eight minutes later there was a mix-up at the back from Sons as Ryan Hardie took the ball from Dougie Hill and rolled it past keeper Scott Gallacher for 2-0. From then on the visitors had their backs to the wall as Livingston sought to press their advantage. There was little change for Sons after the break, as Livi moved the ball around confidently. The nearest Dumbarton came in a dispiriting game was three shots on target, with Tom Walsh nearly squeezing the ball in from a wind-assisted corner. One consolation for the travelling fans was a good debut by striker Kevin Nisbet, on loan from Partick Thistle. The picture shows Iain Russell being felled by Lions skipper Craig Halkett.